Are you ready for a tearjerker, folks? The Mill worked with Anomaly and directors, The Malloys on this Budweiser Super Bowl spot, rightly named 'A Hero's Welcome.' 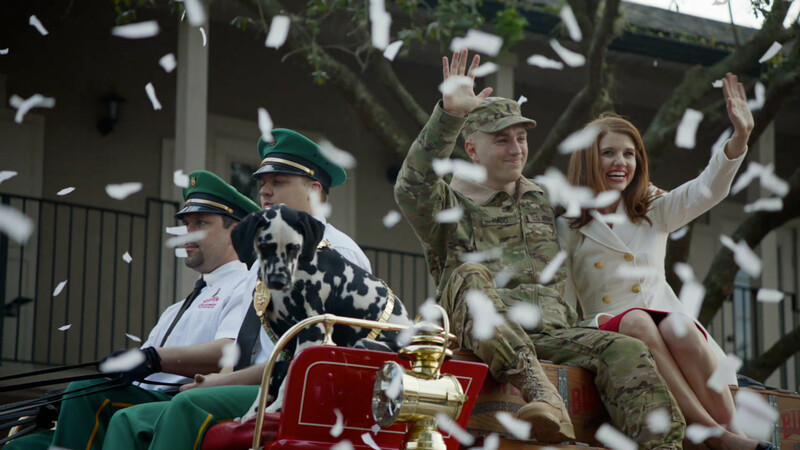 In an ode to returning military troops, it features Army Lieutenant Charles Nadd, returning home to his family and being greeted with a surprise parade through the streets of his hometown of Winter Park, FL. A marching band, military vehicles, the VFW motorcycle club, and the famous Clydesdales all join the festivities. The Mill's Lead compositor, Jamin Clutcher tells us "From the onset I knew this was going to be a really powerful spot and a spot that I was really proud to work on. "You can't help but get wrapped up in it (I think it consistently made me cry the first five times I watched it...seriously). It was wonderful to feel like I was a part of his return celebration; helping tell the story and share in his triumphant Hero's Welcome. "Our job is always easier when we have great footage to start with and it's impossible not to see that we got to work with some beautiful imagery simply because everyone's reaction is genuine and heartfelt. This is one I'll always remember."